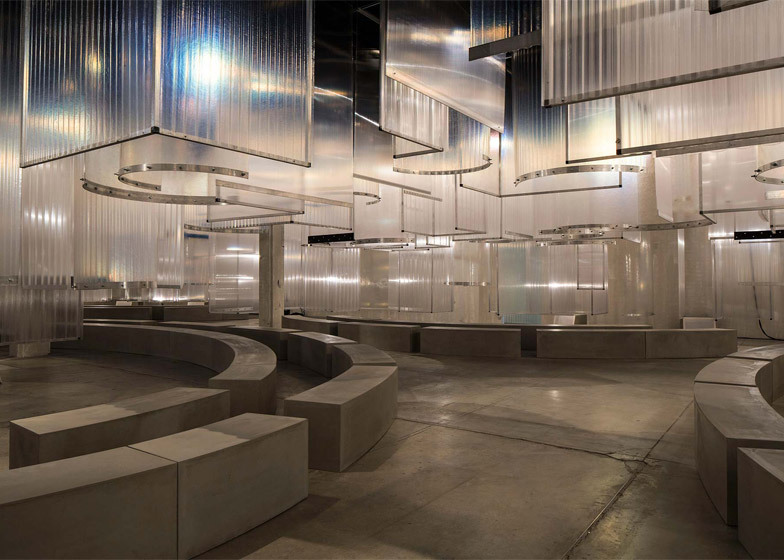 OMA's research arm AMO hung translucent sheets above concrete seating for Italian fashion house Prada's Spring Summer 2016 fashion show (+ slideshow). 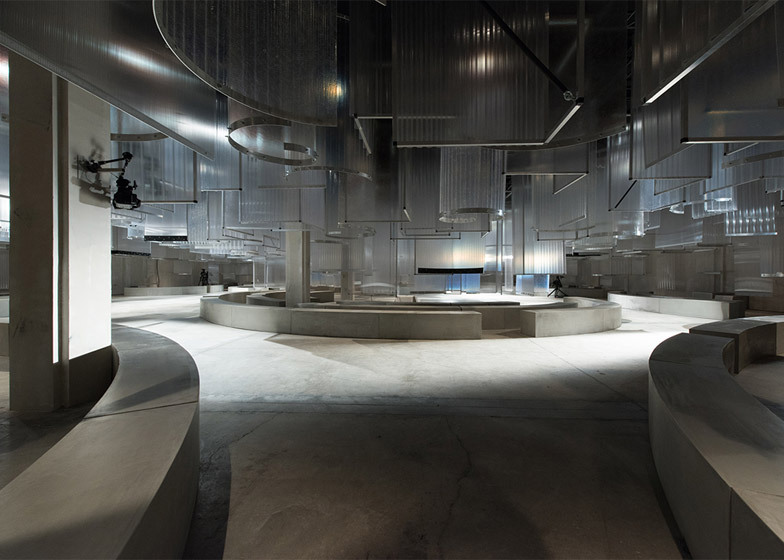 The Prada menswear catwalk presentation, which also featured looks from the pre-spring womenswear collection, took place on Sunday at the Via Fogazzaro show space in Milan. 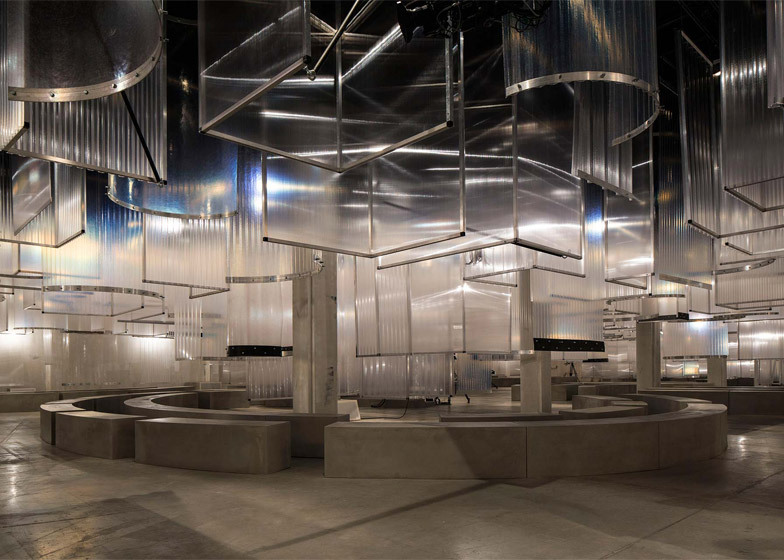 AMO – the research branch of Dutch architecture firm OMA – continued its longstanding collaboration with Prada to design the Indefinite Hangar installation for the runway set during Milano Moda Uomo, the city's men's fashion week. The cavernous room inside the old factory building was transformed by suspending vertical translucent sheets from the ceiling. 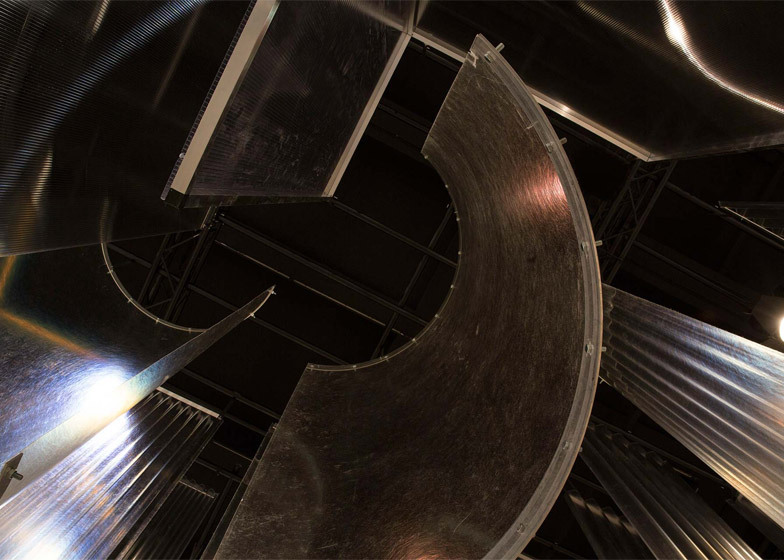 The smooth fibreglass and corrugated polycarbonate surfaces were fixed at 90-degree angles to each other, or curved into partial tubes using metal framework. 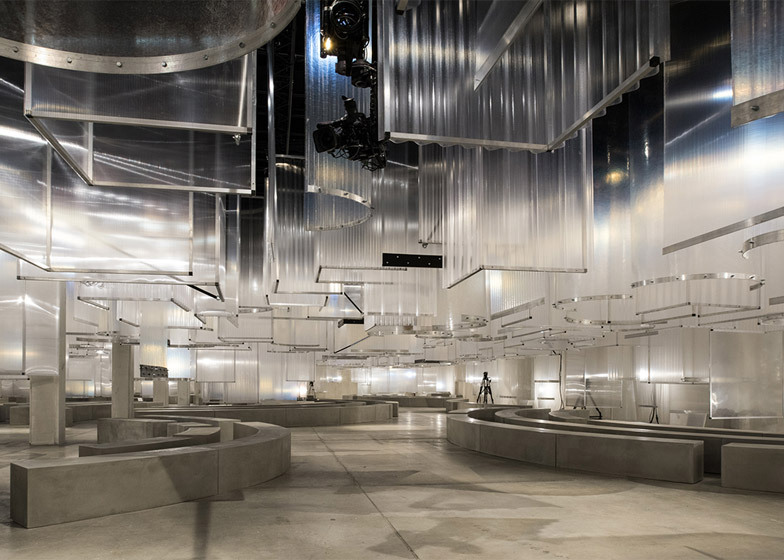 "Plastic sheets hang down acting as a virtual mould that defines the catwalk and seating areas, while the concrete ground area acts as the negative of the above scene," said AMO. 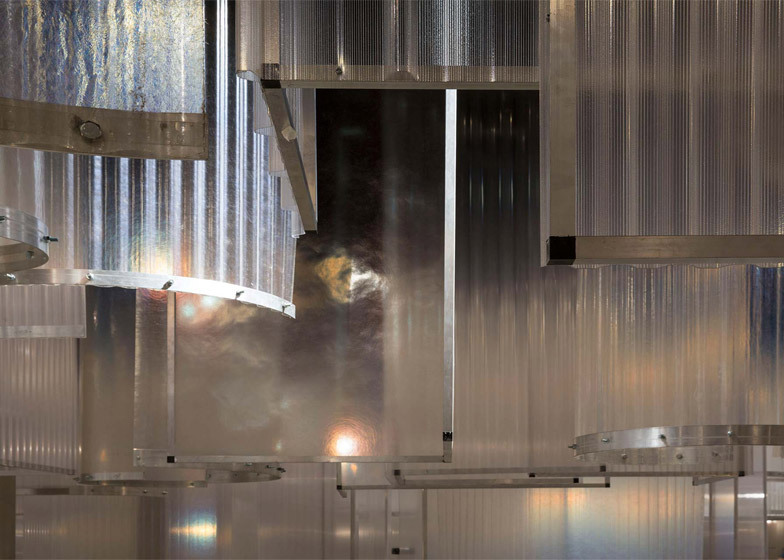 The semi-transparent materials diffused and reflected the glow from ceiling-mounted spotlights. "The fibreglass and polycarbonate stalactites manipulate the proportions and perspectives of the brutal and industrial space," AMO said. "These alternating levels of views and transparencies introduce the guests to a blurred horizon." 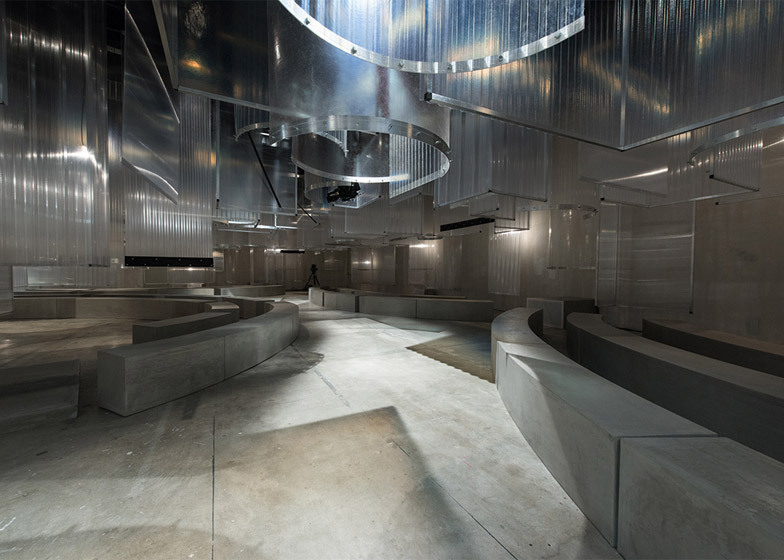 Elliptical seating areas comprising concentric rows of arc-shaped benches were covered in concrete to match the floor and walls of the existing space. 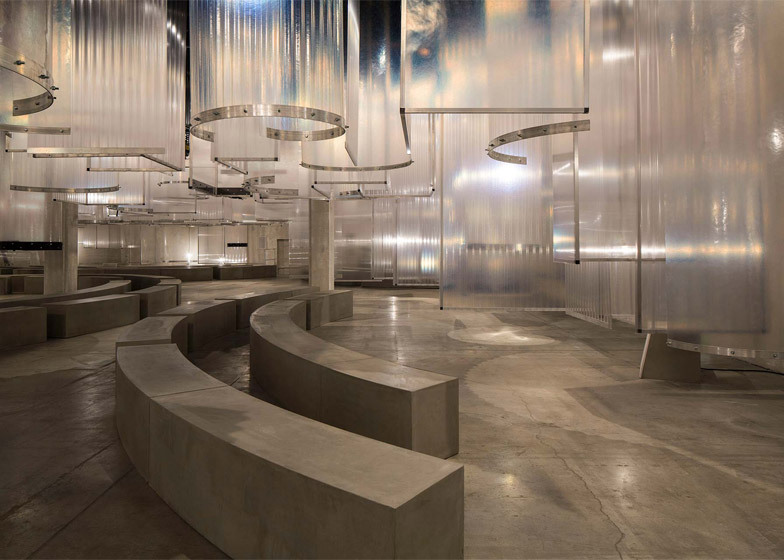 "The wall, floor and seats, covered in concrete, emerge as a remnant, disturbing the boundaries between seating and catwalk," said AMO. 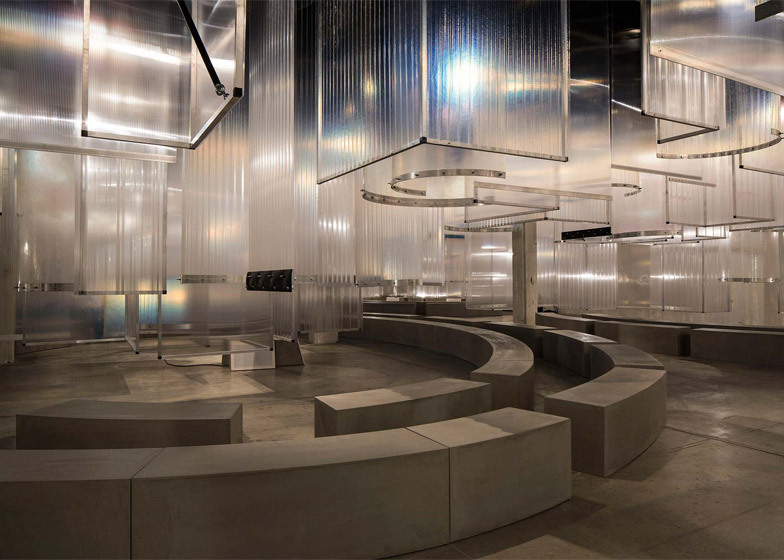 The catwalk circled the central seating area, with models also passing extra benches for guests positioned around the outside. 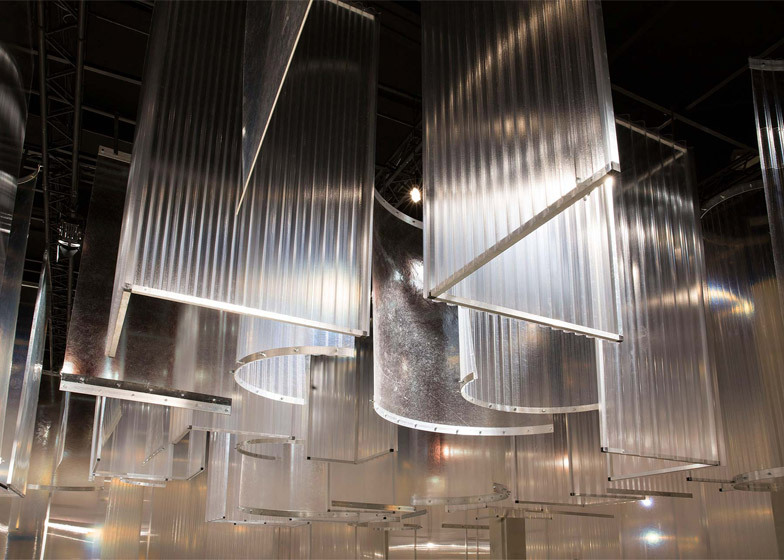 OMA and AMO have worked with Prada for over 25 years as a result of a personal relationship between their founders – architect Rem Koolhaas and fashion designer Miuccia Prada. 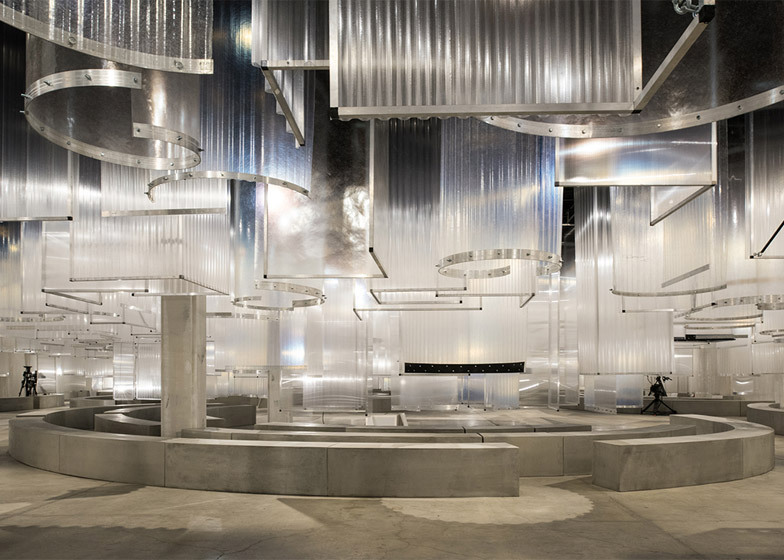 Previous catwalks designed for the fashion house include a series of linked symmetrical vestibules and a runway that floated on a blue pool, while other projects have included store interiors, furniture collections and even a portable, shape-shifting cultural pavilion. 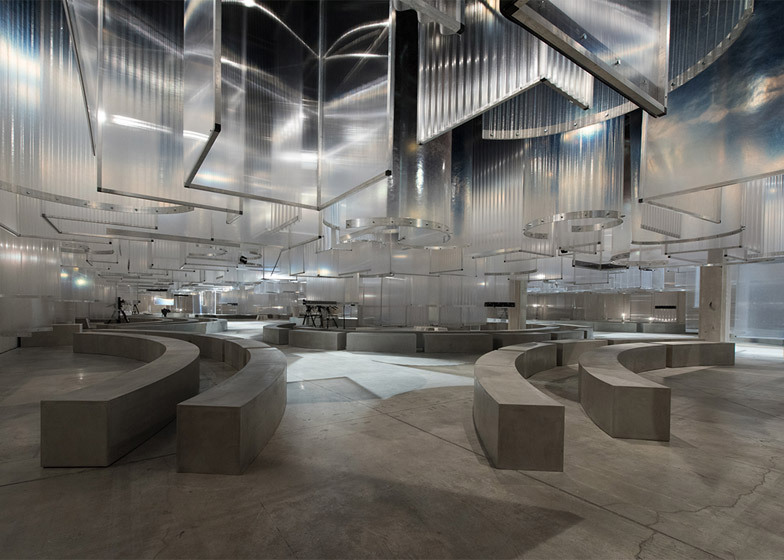 OMA recently completed the Fondazione Prada – a new arts centre inside a former distillery in Milan that opened in May 2015. The building is designed to host a cultural programme that includes temporary art and sculpture exhibitions, film screenings and philosophical discussion. It contains a "haunted house" clad in 24-carat gold leaf and a cinema camouflaged by mirrors, as well as a bar designed by director Wes Anderson. 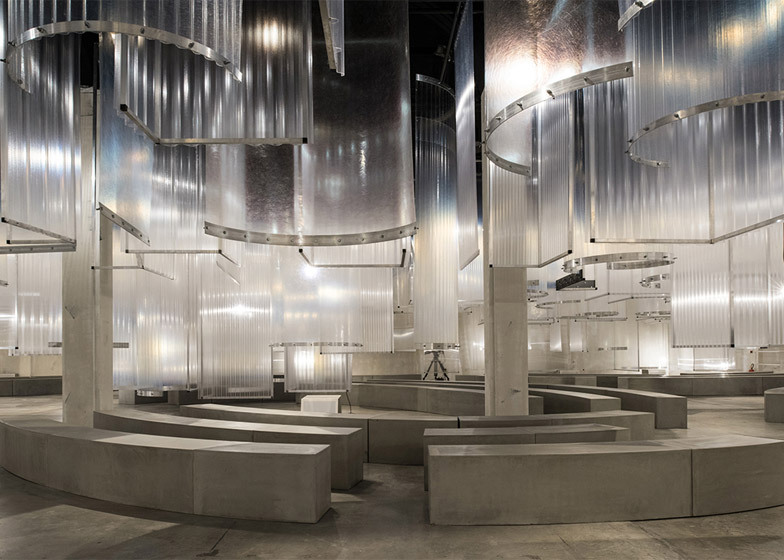 Milano Moda Uomo runs from 19 to 23 June. 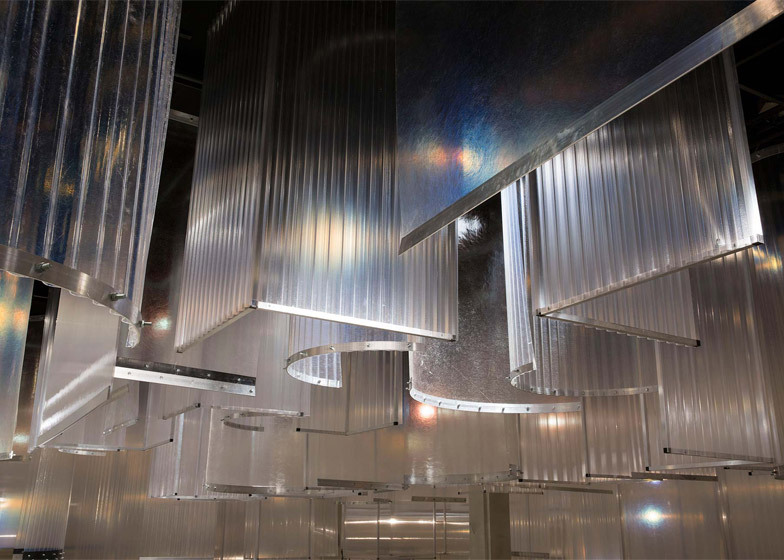 London's batch of Spring Summer 2016 menswear shows occurred earlier this month, when a series of presentations took place at a space illuminated with lights projected through perforated boxes. After Milan, this season of men's fashion shows will move on to Paris before finishing in New York in July. Photograph is by Alberto Moncada, courtesy of OMA, unless specified otherwise.